Solid steel crowning files with dual cutting edges for precision fret crowning. These should be in any luthier’s tool kit! Large S-T214-L Body Width 0.622 in. Large S-T214-L Item Length 7.625 in. Large S-T214-L Packaging Dimensions 9.3125 in. x 1.5 in. x 0.295 in. Medium S-T214-M Body Width 0.625 in. Medium S-T214-M Item Length 7.625 in. Medium S-T214-M Packaging Dimensions 9.375 in. x 1.5 in. x 0.282 in. Small S-T214-S Body Width 0.629 in. Small S-T214-S Item Length 7.5625 in. Small S-T214-S Packaging Dimensions 9.3125 in. x 1.5 in. x 0.282 in. All models Weight 0.22 lbs. 1 answers Will this work on medium jumbo frets? Yes, we recommend either the medium or large for medium jumbo frets. 1 answers What size fret will this large fret file work on? The large fret crowing file is not designed for a specific fret size and will work in situations where a large fret file is needed. 1 answers Is this a diamond dust or standard tooth file? This is a standard tooth file. 1 answers Is this a double sided file? Yes this is a double sided file. 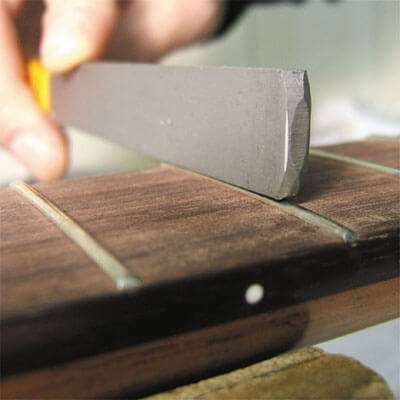 1 answers Will the large fret crowning file work for jumbos, as well as frets the medium crowning file works on? Yes, we recommend the large file for medium jumbo and jumbo frets. Another great tool at a realistic price. No label politics.